Bubby Makes Three: My Big Little Treat to Myself! My Big Little Treat to Myself! On Sunday, I awoke feeling... well... a little less than 'fresh', shall we say. I think I may have had a small bout of food poisoning from some Thai the night before. It was bucketing down with rain, Dan had the day off work and really I had all the excuses in the world to just lie in bed for once and do. nothing. But I didn't, of course. I'm not capable of that. So I dragged myself out of bed, decided eating was an activity that should best be delayed for the next 24 hours and decided to go shopping! 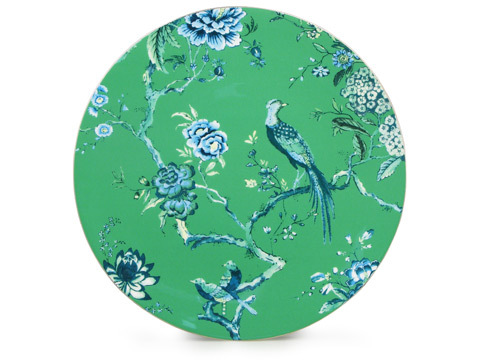 It's the Jasper Conran Chinoiserie Green platter by Wedgewood. I didn't have quite enough money on my gift card, and had to fork over an extra $50. But I think its worth it. And I'm really glad I bought something for me. Which is probably why I then hit the kids section and bought clothes for the kids! teehee. How often do you treat yourself to something you love? Oh Nicole, that is just divine! That is beautiful Nicole! I don't really treat myself to pretty things like that very often. Hope your feeling better and good on your for spoiling yourself!! I bought this exact plate for my best friend when she go married last year - it was so hard not to keep it for myself. I completely understand your need to by it - I totally adore it too!! Oh that is so beautiful! It is so nice to spoil yourself once in a while. Peek Inside... Fern and Elliott's Cubby! In which the sandpit becomes a VEGGIE PATCH! Hi! I'm Nicole... a creative, details obsessed girl that literally cannot sit still! I'm passionate about my sewing projects, animals, licorice allsorts, craft and cook books and my two adorable children... though not necessarily in that order! My blog is a diary of my muddle through motherhood, a journal of things that inspire me, and a way to communicate with the world whilst wearing my uggies! This site is the intellectual property of Nicole Cleary. If you don't own it, don't steal it.. Ethereal theme. Powered by Blogger.